Great for business type settings where high popcorn output is a must, this 16 oz. Theater Pop popcorn machine yields up to 295 servings of popcorn per hour! Our American-made Theater Pop Commercial popcorn machines are unparalleled in quality and workmanship and comparable to the professional popcorn machines you find at the movie theaters. Ideal for Large Scale Commercial Production. Largest Capacity Popper on the Market. Uses a Gas Spring Assisted Kettle for Easy Unloading. High-output, Hard-coat Anodized Aluminum Kettle. Built-in Warming Deck Warms Popcorn. Old Maid Drawer Catches Unpopped Kernels. 50 Watt Presentation Lamp Highlights & Warms Popcorn. Produes Sixteen - 1 oz. Kettle Size: Output: Dimensions: Electrical. 16 ounces 295 - 1oz. Servings Per Hour 28" W x 20" D x 36 H - 109 lbs. 120 VAC - 2790 Watts - 24 Amps. Requires 30A Circuit: Plugs into a NEMA Style 5-30R Outlet. Available with Matching Cart for an additional. Places Popper at Ideal Operating Height. Better Merchandising and Greater Mobility. Provides Storage Area for Supplies. All of our poppers feature this kettle for optimum performance and easy cleaning. We only use aluminum because it has the highest heat transfer rate of any approved cooking material. Then we hard-coat anodize the kettles to create a non-stick surface that resists carbon build-up and is a snap to clean-just wipewith a damp cloth. Side-hinged popcorn kettles provide easy access to the inside of the popcorn machine kettle, thereby allowing for simple and convenient routine cleaning. This routine procedure prevents the difficult-to-clean "baked on carbon" that is prevalent in oil-based cooking appliances. With ordinary popcorn machine poppers, time-consuming and difficult disassembly of the kettle is required for cleaning. 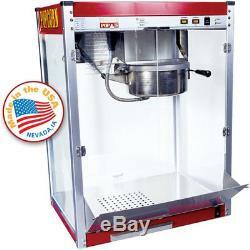 The popcorn machine popper incorporates a 50-watt heating element underneath the bottom tray. Since heat rises, bottom heating is preferable over heat lamps that only heat the top layer of popcorn. This bottom heating element provides the optimum amount of heat to keep your popped corn continually warmed to the ideal serving temperature. Depending on the humidity level, popped corn can stay fresh all day if kept at the proper temperature. Conveniently built into the base of the popcorn machine is a stainless steel drawer to collect the unpopped kernels (commonly called "old maids"). The small holes in the bottom tray are just the right size to allow the old maids to fall through while keeping the fully popped corn in the serving cabinet. The drawer is easily removed for emptying and cleaning. Our cabinets feature aluminum extruded side post construction so they have superior structural integrity. The extrusions are designed to withstand heavy commercial use without damage. Channels inside the side posts protect wiring from oil residues that cause electrical shorts and operation interruptions. Tempered glass side panels slide right into the channels. All metal on the cabinet is finished with powder-coated paint that resists chipping. The inside of the popcorn machine cabinet is illuminated by a 50-watt R20 lamp. This miniature flood lamp is ideal for highlighting the popped corn for added impulse sales. The lamp also provides light for added safety and convenience for the popcorn machine's operator. Stainless Steel Foodzone and Tempered Glass Panels. 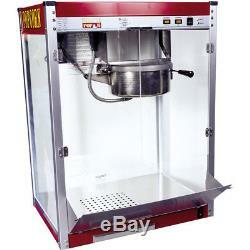 The bottom tray, drop door, and old-maid drawer of the popcorn machine popper are constructed of stainless steel and are removable for easy cleaning, in the dishwasher or in the sink with any mild detergent. The side and back panels are made of tempered glass for safety and ease in cleaning with standard household glass cleaners. 16" W x 14" D x 24H. 20" W x 14" D x 26 H. 20" W x 14" D x 29 H. 24" W x 20" D x 36 H.
28" W x 20" D x 36 H. 17" W x 34" D x 30 H. 17" W x 38" D x 30 H. 20" W x 46" D x 30 H.
16" W x 14" D x 32 H. 20" W x 14" D x 32 H. Available Supplies and Accessories for your Popcorn Machine: Add Options of choice at Checkout. 24 - 8oz Starer Packs. 1 Gallon Canola Popping Oil. 100 - 1.75 oz Boxes. Includes 16oz of Butter Topping. 24" L x 13" H - 8 lbs. The item "Commercial Popcorn Machine Maker 16 oz. Kettle Popper Movie Theater" is in sale since Saturday, September 3, 2016. This item is in the category "Business & Industrial\Restaurant & Catering\Vending & Tabletop Concessions\Tabletop Concession Machines\Popcorn". The seller is "gameroomfanatic" and is located in Chicago, Illinois. This item can be shipped to United States.